Most people don’t usually watch The View to find out about comics, but that was where Marvel chose to announce that the new Thor would be a woman. This news garnered a wide range of reactions, from outrage to euphoria. Seemingly endless comments flooded the internet, and some chose to write to the author himself. Jason Aaron has been writing comics for nearly a decade, and he’s been writing Thor for two years. Despite this, many fans believed he and Marvel were doing this just to create controversy and make money. Jason Aaron signing copies of his comics. Fortunately, local fans were much more enthusiastic about the changes in Marvel, as Aaron found out when he came to Alter Ego Comics in downtown Muncie on Saturday to promote the new Thor and sign his other comics for fans. The building was packed with people waiting in line, and owners Christy Blanch and Jason Pierce were thrilled. Blanch, a published comic writer herself, is friends with Aaron. “I’m so proud of him for writing this,” she said. Quinn Hurley, a former intern at Alter Ego, said he trusts Marvel to do this project. “I think this is the greatest thing ever. I was elated when I found out,” he said. Since only the first issue has been released, not much is known about the new Thor. The old Thor, or the “Odinson,” has been deemed unworthy to wield his famous hammer, Mjolnir. In his stead, someone new picks it up, thus gaining the powers of the god of thunder . Both characters will be in the comics, and will meet in later issues, but they each have their own separate story lines. “It’s not like Batman and Robin,” Aaron said. Many people were initially confused by this. The Odinson is not changing his gender or disappearing. Aaron is exploring his character in a whole new way by showing the challenges of worthiness and being a god, something that hasn’t been done to this extent before. So why does the new Thor have to be a woman? The new Thor’s costume design looks remarkably similar to the Odinson’s. “We wanted her to look like Thor, not Thor’s back up dancer,” Aaron said. They wanted her to look like the powerful Viking goddess that she is. Thor originated in Norse mythology, and it shows. Aaron was not pressured into this change by Marvel; in fact, he brought the new story to them. Female comic readers are not a new concept: according to The Atlantic magazine, a Market Research Company Study from 1944 found that 95 percent of boys and 91 percent of girls between ages 6 and 11 read comics. The Atlantic also mentions a Facebook study based on “likes” done by comics blogger and political consultant Brett Schenker that found 41 to 47 percent of fans were female. 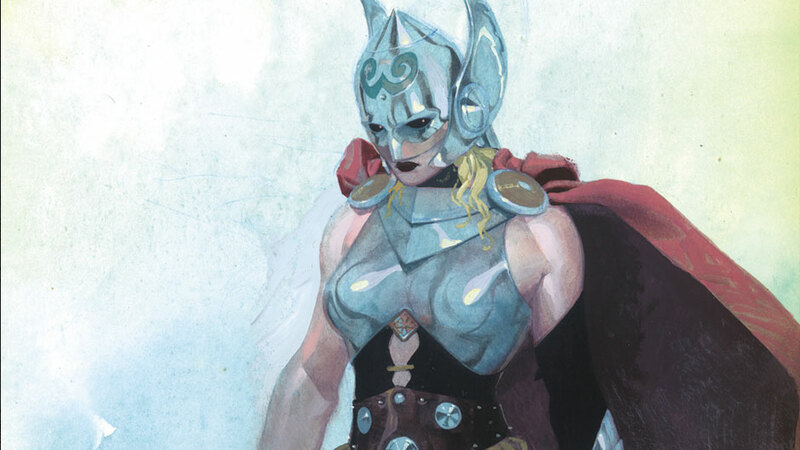 Wherever the new lady Thor takes us, it’s certainly proved worthy of great attention from fans and critics alike.